This card may not be exchanged for cash. This card is not a cheque guarantee, credit, debit or charge card. No change will be given but the balance can be used for future purchases. We will not be held liable for lost or stolen cards - protect this as you would cash. To check the balance of your giftcard please visit www.browns-restaurants.co.uk/giftcards A giftcard is valid for 12 months from the date of purchase. This card is valid at any of our venues in the UK as well as any other Mitchells & Butlers venue. You can search all available venues here: https://www.mbdiningout.co.uk/. Gift cards can be purchased with a minimum value of £5, up to a maximum of £250. Text and email gift cards should be treated as cash. If deleted they will not be resent. Any remaining balance will be provided as another email or Text sent to the guest. SMS gift cards will be free to receive for the guest. Email gifts are valid either presented on a smart phone or printed out. All text and email gift codes are unique, and cannot be used more than once - any remaining balance will be reissued in a new email or SMS. We reserve the right to amend the terms and conditions. Further terms and conditions are available upon request. 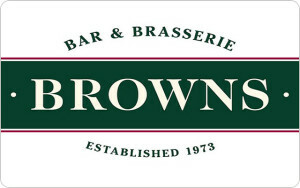 Treat someone special to a stylish evening out at Browns Bar and Brasserie with a Browns gift card. Choose an amount and send a present that can be put towards a meal for two, cocktails with friends, a three course dining extravaganza or an elegant afternoon tea. The first Browns bar and brasserie opened in Brighton in 1973 and today, you can find some of the same classic dishes on menus in their stylish restaurants across the nation, alongside contemporary plates and a classy selection of drinks. If you know someone who already loves the charm of Browns restaurants, why not treat them to a meal that includes all of their favourites? For anyone new to their elegant dining experiences, a Browns gift voucher is the perfect way to introduce them. There’s always a buzz at Browns, so why not send someone who loves eating great food in striking surroundings a chance to do what they enjoy best! This card is valid at any of our venues in the UK as well as any other Mitchells & Butlers venue. Email gifts are valid either presented on a smart phone or printed-out. This card is valid at any of our venues in the UK as well as any other Mitchells & Butlers venue. Email gifts are valid either presented on a smart phone or printed-out.waiting staff.